*I received the advanced reader's copy of this book from the publisher for review. This does not affect my opinion or the content of my review. All thoughts/opinions are my own. This post contains affiliate links. I am an Amazon affiliate and I may receive a small commission if you make a purchase through one of my links. 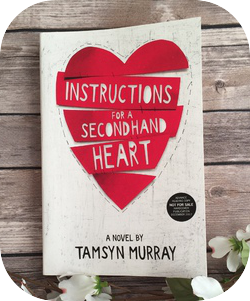 Instructions for a Secondhand Heart was a moving contemporary young adult novel. Be sure to have a box of tissues with you when you read this because the story may make you cry. I used up quite a lot of tissues while reading this book. This story is told from the perspectives of Neve and Jonny. Neve has spent her life comparing herself to her twin brother, Leo. She feels that Leo is the golden child of the family, he gets all the love and adoration from their parents. In the beginning of the story, Leo dies in an accident and Neve's world is forever changed. Jonny spends his life in the hospital, waiting for a heart transplant, until one day a donor match is finally found. He seeks to find out about his donor, which eventually leads him to Neve. This story gave me a lot of feelings. I usually don't cry while reading books, but this book had me reaching for the tissues. I felt for these characters and I really enjoyed the story. I loved the complicated relationship between Neve and Jonny, and I thought they were both interesting and well-developed characters.